Porsche’s attempt to end their Le Mans prototype program with a win like their sister-marque Audi did last year isn’t going so hot. The No. 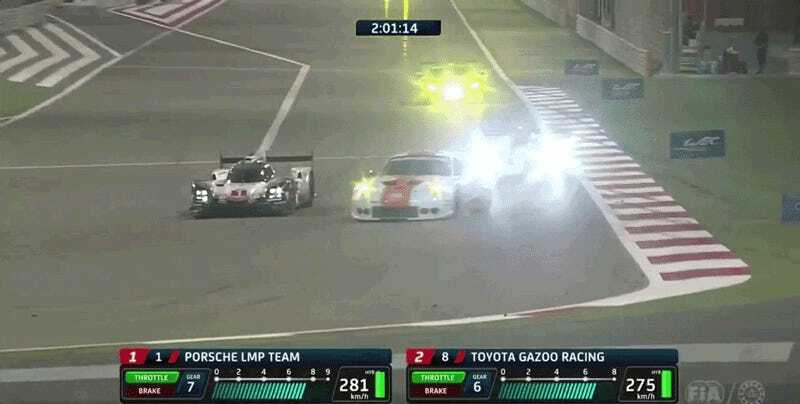 1 Porsche 919 LMP1 collided with the No. 86 Gulf Racing Porsche 911 in LM GTE Am, taking it out of the overall lead and handing it right away to the No. 8 Toyota right behind it. Nick Tandy was completely gutted by the collision, which happened with just over two hours left in the 6 Hours of Bahrain and damaged the front left of the No. 1 car. Porsche swapped the car’s nose with ludicrous speed, however, the kerfluffle still dropped them down to third place when they were in the lead. “He was out really wide and I just assumed he was giving us space,” Tandy said of the No. 86. The next-highest Porsche, the No. 2 Porsche 919, was a lap behind the leading No. 8 Toyota when the No. 1 was forced to pit. The No. 2 car had hit a bollard on track early in the race that forced it behind the other teams. Even further behind it, however, still sits the No. 7 Toyota TS050, which collided with the No. 92 Porsche 911 RSR about an hour earlier and was forced to come in for lengthy repairs to its side. The No. 86 911 is also in its final race ever, and they’re pitted right next to the Porsche 919 team. That’s not awkward at all. Its weekend hasn’t been going so well, either, after a fire in practice forced them to skip qualifying. After colliding with the No. 1 car, it was forced to limp back into the pits with a puncture. This is definitely the No. 8 Toyota’s race to lose from here on out, but given that endurance racing (especially in this race) is mayhem incarnate, who knows what will happen before the race ends. UPDATE [12:53 p.m. ET]: The No. 1 briefly retook the lead from the No. 8 as the No. 8 pitted with around an hour and ten minutes to go. However, stewards handed the No. 1 a stop and go penalty for it contact with the No. 86 Porsche that it will need to come in and serve. Meanwhile, the No. 86 has a flickering headlight which it will have to fix.